I had not seen a recent Battletech related N&R thread, so thought I would start a new one. Tech Raptor interviews Catalyst Game Labs, who is now sharing the spotlight quite a bit with HBS after the overwhelming success of the recently released Battletech computer game. Thankfully Catalyst has new starter sets coming soon, as the last 2014 set (itself a redo of the 2009 starter set) has been unavailable for a couple years now. The Wolverine and Griffin from the Beginner Box Set. I'll be getting at least one of each set just for the Anthony Scroggins (Shimmering Sword) Mech redesigns. 2018 is the year of the giant robot it seems! Same and I am in the process of selling my BT collection. Those plastic minis are nice, though! As someone looking in from the the outside, I always thought the Mad Cat was the iconic Battletech mech, the only instantly recognizable mecha in their range for mainstream audiences. So, why is it not in the starter set? The Timberwolf (aka Mad Cat) is from the Clan Invasion, which is late 3049. The starter sets are from 3048 and before. It's addressed in the article, but the basic reason is that the starter sets will always be from the "beginning" of the game timeline (fourth Succession War) while new products are developed in the advancing timeline (which is like now in the 3140's or whatever). Mechanics-wise, the Clan invasion introduces a whole new level of tech and rules, aptly named Level 2, because it's much higher technology level. Starter sets are the core, Level 1 rules. TechRaptor: BattleTech is a huge IP with its own deep running history. HBS/PBX chose to start their game near the very start of the BattleTech timeline. Which era are you basing the new releases in, or making access to, and why did you choose these eras? Brent Evans, BattleTech Line Developer: The ongoing BattleTech saga has a rich wonderful history spanning hundreds of years in-universe, and hundreds of products in real life. Each of the video games has launched from their own intended niche in the history, but a big part of that choice is their intentions to have space and time within Eras to expand into and through various universe events (like the Clan Invasion, Civil War or Jihad) in order to use story-line to fuel their future expansions. By contrast the tabletop side of the property has to do two very different things; first we need ‘gateway’ products which serve to bring new players into the universe, which is often done best with tech dated prior to the Clan Invasion. At the other end of the spectrum we must drive the forward-most point of the epic saga, using story as the forge keeping the property current and relevant. So while the video games get to bring alive specific points in this timeline, the tabletop game is really the steward of the universe and has always been the driving force moving that timeline forward. This is why you’ll see introductory products like the new Box Sets (set in the pre-3048 Era) release alongside the “Shattered Fortress” sourcebook (which begins in the year 3146.) We keep the fires burning bright at both ends of the spectrum. TR: The Mechs in the two starter boxes do look incredible. Players are obviously all going to have their own favourite Mechs that might not be included in those sets (mine is the TimberWolf if you could make that a priority please!). What can you say to put their minds at ease? BE: The enormous positive response to those miniatures is not lost on management at all. We’re keenly aware of the desire for more miniatures along the lines of those in the boxed sets. Depending on the success of those sets, we certainly hope to do more like them in the future. This is also my chance to shine the spotlight on the incredible efforts of Iron Wind Metals and their ongoing line of premium miniatures for BattleTech. The IWM team have been incredible supporters of BattleTech over the years, and while Catalyst’s new line of box set products are perfect for leading new players into the universe, that will ever only be a mere appetizer to the enormous number of units available throughout the Inner Sphere – all purchasable through Iron Wind Metals. Not only do they have nearly every unit ever produced for the game, but they have a wide selection of variants and customizable pieces which is unmatched! The colorful folks at IWM are constantly working with me to make sure their product line up is up to date and can meet the needs of every player. When it comes to BattleTech, the premium line of miniatures will always be found with IWM. Finally! One thing you can never say about a product from CGL is that it was rushed to market! As fond as I am of the derpy IS mech designs, I suspect these more modern looking bots will really help these new sets fly off the shelves. Fun fact - I purchased 3 IWM mechs, a Super Griffin to use as a regular Griffin and two different Thunderbolts to cobble together something that actually looked decent.. and both of those mechs are represtend here and looking far better than my own attempts. Dang it! Looking forward to this. Battletech's one of my true loves in gaming, even if I have a hard time getting people to play outside of Gen Con. I sold most of my classic mechs and replaced them with 3d printed Mechwarrior Online mechs. So I'll 100% be getting these bad boys as they match the modern aesthetic! Yeah, the MWO redesigns really fix the VERY outdated designs on those mechs. There's a seller out of poland doing resin MWO designs that I've gotten a few of, but I don't play enough to replace my entire collection. I'll be glad to have these in plastic. Actually I find most of the MWO Mechs' to look to much alike. They have very little distinctive style overall. A few are quite nice, but as a whole they are boring. The Battletech redesigns manage to do a similar job while still retaining enough distinctive style for each design. IMO of course. Also its the 80s again, I want to buy New Battletech and new Adeptus Titanicus. I love the MWO designs btw. A lot of BattleTech artwork is really outdated and looks kinda silly. MWO gives them a more modern and serious look, while keeping the distinctive features of each 'Mech. I like that. Also, really interested in the Gray Death Legion prequel, as I actually just finished reading Decision at Thunder Rift (it was a lot of fun to see the similarities and differences in BattleTech back then and now). I hope they will make Clan 'Mechs at some point as well. I love the Clans. I haven't CBT'd in probably 15 years and the game is probably still bad, but I'm definitely picking both of these sets up! The plastic minis look incredible and I have been playing the heck out of HBS Battletech. This should scratch just the right itch. I hope that they'll prep the minis a bit better than the one below that still has the 3d printing stepping visible. Spartan Games had the same issue before their closure with their showpiece huge ship models before they shut down. Regardless, good to see Battletech players get a new starter and minis with the release of the PC game. It'll be right on time for me to give it my once in a decade try and see if I've (or its) changed enough for me to get into it. I hope that they'll prep the minis a bit better than the one below that still has the 3d printing stepping visible. I don't necessarily know that is completely print layer lines as it is just lower poly file used. Some of them appear to be layer lines, while others don't make sense to be layer lines because of where they are placed. The most visible ones make it seems it was printed as one piece 90-degree standing. But there are other lines that look like layer lines diagonally so not sure if they printed multiple pieces then assembled. 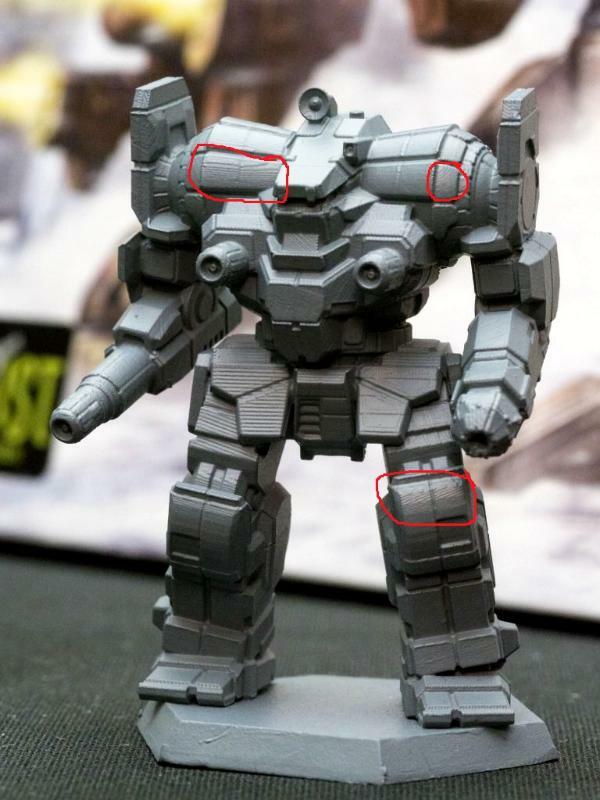 Then there are what appears to be mould lines, but not sure if just bad lines put in to look like armor panels to disguise mould lines like older models have been. I hope they do the entire stable of Succession Wars classics. I'm probably going to be in for one of the Beginner boxes and a couple of the main set. I've wanted a decent Awesome and Catapult for 20 years, so I'm doubling up on this. CGL have said that they don't want people doing the "Oh, I don't want to buy up all the boxes, I want new players to be able to buy sets and get into the game". They've basically said "buy! buy! buy!". They get more money, they get to release more new products. If people want their Timber Wolves, they've got to make it worth CGL'S time and money. What's a 7th Catapult mini, right? Though I am surprised that we're getting a new starter box that doesn't include an Atlas. That's a shame. Either way, glad to have these back. Will be picking up both. And more maps is a good thing. I believe these lines are what were being referred to. To be fair CGL needs to make this re-launch worth player's time and money too. Battletech has been of life support for a few years now since key products were OOP and hard to find which has made growing the player base difficult at best. These sets look good, and I am excited, but they need to get the core products like map sheets and starter boxes available and easy to buy. More plastic lance boxes like the $9.99 ones they just discontinued would be nice too, especially if they have redesigned `Mechs in them similar to the ones in these starters. The sculpts are great but CGL moves too slowly to keep customers' attention. So far I'm planning for at least one of each box. Chillreaper wrote: I've wanted a decent Awesome and Catapult for 20 years, so I'm doubling up on this. I don't believe they've updated the Catapult as of yet, so you may be in for a bit of a wait for that one. Manchu wrote: The sculpts are great but CGL moves too slowly to keep customers' attention. Yeah, CGL is one of those who really work on a shoestring budget. If BattleTech didn't have the history that it does it would have folded long ago. Battletech is one of those games that should be an unstoppable juggernaut, but has forever let itself by held back by its glory days. Never is this as infuriating to me as when the timelines come into play. There are just so many.... dull, mech designs that every time they fail to redesign the game around their iconic mechs that aren't stolen, it just feels like a huge missed opportunity. The game could absolutely soar with full reboot, but forever seems content to limp along on its nostalgia factor. The catapult is right there on the back of the "Battletech: A Game of Armored Combat" box. On the first post. I agree that they're inconsistent. For instance, the grooves on the left hip pad is very strange and obvious and, most importantly, not consistent with the finer stepping visible around the knees. I don't think it's a low poly problem though as visible triangles/facets on curves aren't prominent to my eyes. I do think your suggestion that it was printed in multiple pieces instead of as one single piece model (maybe at differing layer resolutions too?) is the simplest explanation as to why there are so many different orientations. Yup, thanks for pointing them out. For a model not being sold as a raw 3d printed product but instead used as a master for traditional production, I expect those to be filed smooth. If it is instead sold straight from the 3d print bed, it's acceptable as the end customer should do it. Ymmv. And going by Anthony Scroggins (Shimmering-Sword) DeviantArt Gallery there is no Catapult. What's in the box while it looks like a new sculpt may or may not be an updated design. So at the very least is a new mini, and the design also looks different.